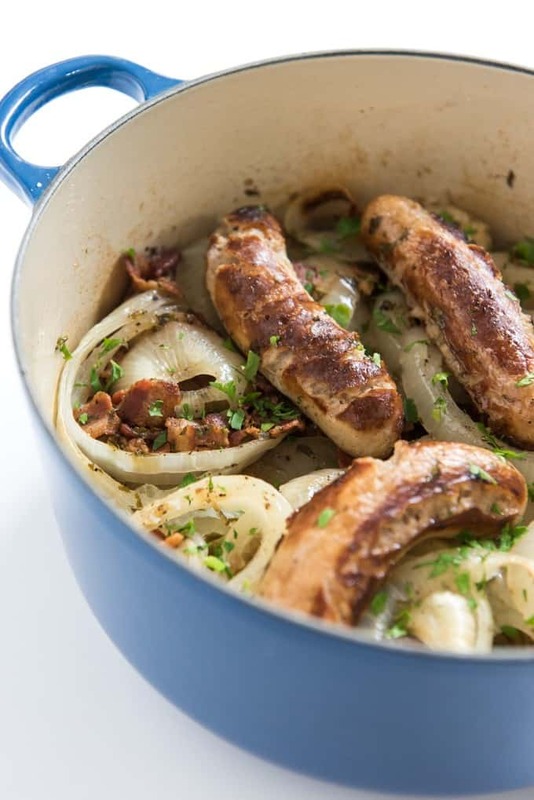 Dublin Coddle is an Irish one-pot meal of tender potatoes, sausage and onions, slow cooked in broth to create a rich, filling stew, perfect for St. Patrick’s Day or any cold, rainy weeknight. Confession time: even though I’m predominantly Irish (and I have the DNA results to prove it! ), I cannot cook corned beef and cabbage to save my life. I like to eat it but I definitely cannot make it. In our first year of marriage, I thought it would be fun to have corned beef and cabbage for St. Patrick’s Day dinner and screwed it up so badly that we ended up scrapping the whole thing and walking to our favorite Indian restaurant and having Chicken Tikka Masala instead. But I really, REALLY wanted to make something Irish to post for St. Patrick’s Day this year! It’s become a bit of a bigger holiday for us since moving to Dublin (California, not Ireland) where there is a St. Patrick’s Day parade and everybody gets school and work off and goes to the big city festival. Our town is way into its Irish heritage. And since getting my DNA results back and learning that I am largely Irish (when all along I thought I was mostly a mix of Scottish and Danish! ), I’ve wanted to learn how to make some delicious Irish food! Since I have never visited the Emerald Isle, I had to let my fingers do the traveling for me. So I googled Irish food, made a list and started working my way through, trying out various traditional Irish dishes like this well-known and loved Dublin Coddle (and a delicious Sticky Toffee Pudding that, while known for being British, is also served for dessert in Ireland). 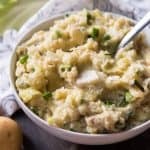 While researching Dublin Coddle I found a number of interesting stories about it (whether true or not, I really can’t say). 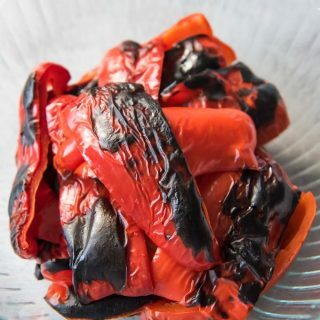 One is that it was made by Irish women on nights when their husbands would visit the pubs since it can be left simmering on the stove and stay warm so the men would have something decent to eat when they got home and the women could go to bed. Another theory I saw said that this is a dish you only find in Dublin and not throughout the rest of Ireland because unlike it’s counterpart, Irish Stew, which uses mutton, Dublin Coddle uses sausages (bangers) which were more readily available and more affordable in the city than mutton which was found more in the rural parts of the country. Regardless, this seems to be a hearty working class dish with humble, common origins. I looked at a dozen or more recipes for Dublin Coddle and realized that the traditional approach is pretty well established as simple layers of thickly cut potatoes and onions with bangers (Irish sausages) and bacon, seasoned with salt, pepper and parsley, and slow cooked for a few hours in broth until the potatoes are super tender (but not falling apart or mushy) and the flavors meld into a rich, hearty stew that is the epitome of Irish comfort food. Some people throw in carrots or leeks or use Guinness, some cut the sausages into pieces while others cook them whole, some thicken the broth while others do not, and so on. I stayed as close to what seemed to me to be a traditional approach as I could and all of us, Paul and the girls included, really enjoyed the results! I actually found an Irish deli/grocer in San Francisco (one of the perks of living close to a major international city) and was planning a trip into the city to pick up some bangers when I noticed in my local supermarket that there were bangers right there next to the bratwurst and kielbasa! While I’m guessing they aren’t the most authentic bangers in existence, they certainly were delicious and their flavor profile definitely differs from most of the sausages I am more familiar with (um, like bratwurst and kielbasa). Try to find bangers if you can, but if you can’t, the texture was a bit more tender than bratwurst or kielbasa and the spices used were closer to those of a country breakfast sausage (but not breakfast links). It’s a bit difficult to describe, but hopefully you can find bangers as easily as I did and you will see what I mean. 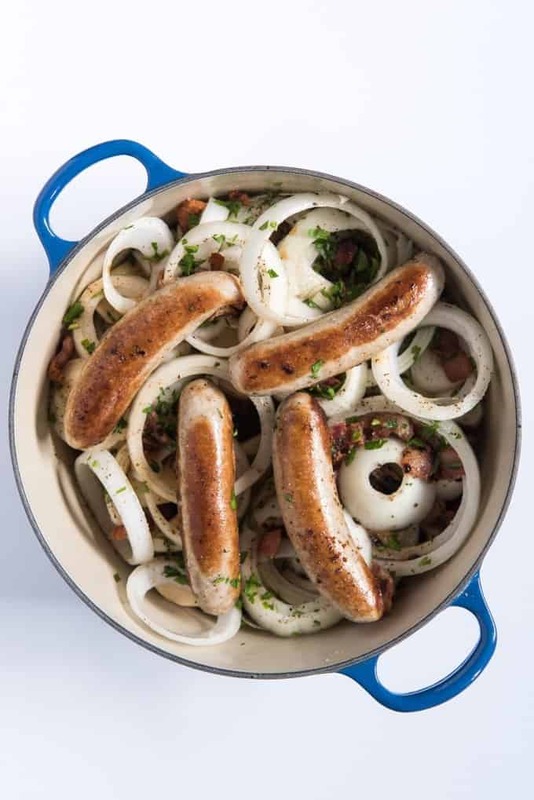 If you can’t find them anywhere, you could honestly use any pork sausage as a replacement and it would be a delicious dinner, it just wouldn’t truly taste like a Dublin Coddle. Ladle portions of the coddle into bowls and serve with crusty bread for sopping up the rich sauce! Don’t wait for St. Patrick’s Day to roll around to try out this wonderful Irish dish! Dublin Coddle is an Irish one-pot meal of tender potatoes, sausage and onions, slow cooked in broth to create a rich, filling stew, perfect for St. Patrick's Day or any cold, rainy weeknight. Heat a dutch oven over medium heat. Add the chopped bacon and cook, stirring frequently, until crisp, then remove from the pan with a slotted spoon and drain on a paper towel. Next, brown the bangers in the reserved bacon fat for a few minutes, just until they start to brown but not so they are cooked all the way through. Remove the sausages from the dutch oven and set aside. Discard any leftover bacon fat in the bottom of the dutch oven. Layer half of the sliced potatoes on the bottom of the still hot dutch oven, then layer half of the sliced onions over the potatoes. Season with salt and pepper, then sprinkle half of the bacon and one tablespoon of parsley on top. Repeat with the remaining potatoes and onions, seasoning with salt and pepper again and sprinkling with the remaining bacon and another tablespoon parsley. Nestle the browned bangers on top and pour the beef broth over everything. Cover the dutch oven with a lid and place it in the oven. Bake for 3 hours, checking halfway through cooking to make sure the liquid hasn't all dried up and adding an extra cup of broth if necessary to keep about 1 inch of liquid covering the bottom of the pot at all times. Remove from oven and sprinkle with remaining tablespoon of chopped parsley before serving. Dublin Coddle is very forgiving and can stand cooking an extra hour or two if you need it, and the leftovers are amazing the next day even. 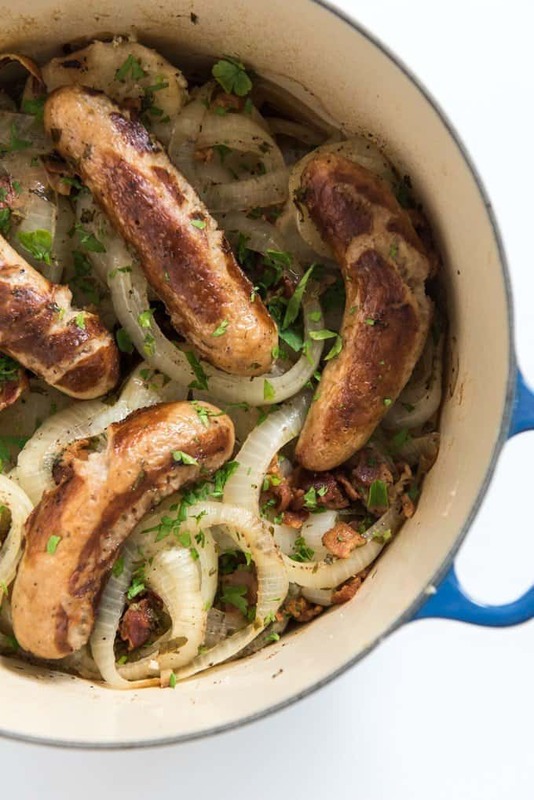 If you can't find bangers, you could substitute with bratwurst, which are also made with pork, or large country breakfast sausages which have a somewhat similar flavor profile to bangers. You could easily make this in the crockpot just completing steps 2-3 in a large pan and then layering everything in a large crockpot and cooking it on high for 4 hours or on low for 6-8 hours. This is our families kind of meal! 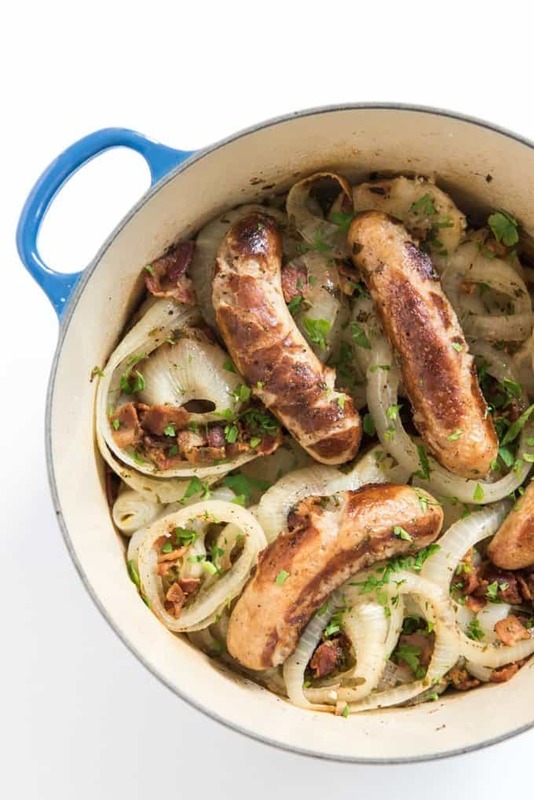 We love bangers and just so happen to have some in the freezer so I can try this for Sunday dinner… and ps… I love the story behind this about letting the wife go to bed…. Ha! That was my favorite story too! My husband and I are both Irish and I’ve never made this. I should be ashamed of myself. 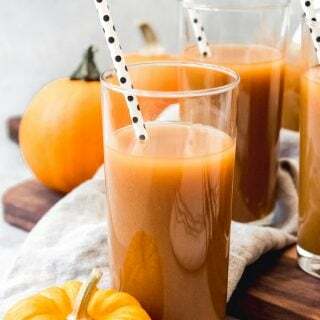 I am on it – this looks so savory and satisfying I have to make it for hubby! I love having an idea for an Irish meal that isn’t corned beef and cabbage (not that there’s anything wrong with it–it’s a classic–but variety is nice to have). This looks delicious! That was how I felt too. Corned beef and cabbage is delicious, but there is so much more than just that! Anything that can be done in one pot is good with me. This looks so comforting for a cold winter night. Wouldn’t this make an awesome one pot family dinner!!!!!!! Love the post and how you have told the story. I actually don’t eat bacon but my kids will love it. This looks delicious! When I was in Ireland, I tried bangers and mash and enjoyed it. I look forward to trying your Dublin coddle! I’m sure I’ll love it. I’ve always wanted to go visit Ireland! How fun you got to see it in person! Bangers are delicious! Small town here, so I’d probably have to sub pork sausage for the bangers. My grandmother is 1/2 Irish. I’ll bet she’d love this for St. Patty’s day. What a thoughtful idea! You never know – I was a little surprised to find bangers at my local market but maybe the grocery stores tend to stock them around March because of the holiday? I thought I saw some bangers at the grocery store up the road from me, I’ll check and try this recipe by Friday. Thanks for sharing Amy! Ha, you are right, they totally do! I didn’t do that intentionally – I guess I just really am partial to those colors, lol. I love the name of this dish 🙂 I know very little about Irish cuisine- thanks for sharing, this sounds lovely. HAHAH…you know I have a similar story. I am Ukrainian…and have eaten lots of sauerkraut in my life. After we got married, I thought I would try and recreate a meal for my new husband. YUP…didn’t go over well. He was very polite and didn’t say anything. I took one bite and spit it out. I know exactly how you feel. bangers is a new term for me! Love to here about new stuff! I would probably try your recipe with this extra Guinness touch, just because it’s St-Patricks day comin soon! Lovely dish! I don’t mind at all, Gillian! I’m flattered! Sometimes it’s the simple recipes like this that are the best ones. They’re definitely perfect for midweek dinners, that’s for sure! Yum! Here in New York, at least, bangers, like Irish bacon, have a way of turning up for just a few weeks at this time of year, so they’d be worth looking for right now, even if you’ve never seen them before! (And if you like them, freeze a few – you may not see them again until next March.) Now I need to remember to look for them this week! 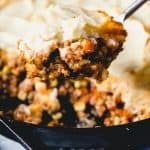 I had not really heard of this dish before but looking at the recipe, this looks like a perfect comfort food for these cold months. What a delicious one pot meal and so easy to make too, I like the idea of cooking it in the slow cooker. 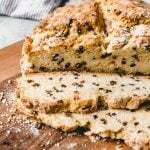 I’m not familiar with many Irish recipes so this is fun to learn about! And I love how you told the background with the story – it would definitely be convenient on nights that our husbands (or kids!) are getting back late, so it can be warm and ready for them! This is such an easy comfort food! I absolutely love it, it looks so good! The story about the pub isnt true unfortunately. It’s a peasant Meal made with leftovers as there was rarely much else to eat. The meat is traditionally just thown into the pot, not browned beforehand. We also don’t have bangers in ireland, that’s england. We just call them sausages, they’re ordinary pork sausages, usually quite small in size. As well as the bacon, sausage, parsley and onion usally there are carrots thrown into the mix. When cooked for a few hours the taste is devine. 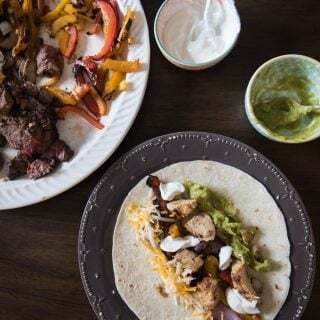 Since I first tried this recipe a couple months ago, it has become one of the favorites in my house. My husband started asking when we could have it again as soon as he finished his first serving! We had to use bratwurst, as the local market in our small town has an abysmal sausage selection, but it works beautifully anyway. Also, when I shared the recipe with my sister, she tried it with turkey bacon (using butter to fry the sausages) and said it is good that way as well. This is absolutely delicious, and I expect it will be a staple in our home for some time. I’m so glad that you guys love this as much as we do! It’s delicious with bratwurst too. Maybe as St. Patrick’s Day gets closer you will get lucky and find that your local market stocks bangers? Some do it just in March for the holiday, especially if you ask to talk to the meat manager! I have this in the crockpot cooking right now and it smells wonderful! Today is St Patrick’s Day and we are going to a church social tonight and are supposed gtobtake some kind of Irish food or something green. Hope it is as tasty as I think it will. I used regular sausage since I did not have any bangers! Regular sausage is super yummy too and bangers can be tricky to find! Sounds like such a fun church social! Love this dish. For the first time i found bangers at publix. Have made this a few times. I love Irish food. Fun to find bangers outside of the month of March! I’m glad you made this. We love Irish food as well! 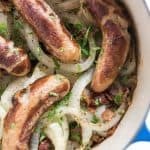 Do you use already cooked sausage/bratwurst? Or the uncooked kind that will cook in the crock pot? I use uncooked. But you could use cooked sausage and just add it later in the cooking process so it can heat through.